Once again the unelected leader of PGFTU has been allowed to sabotage solidarity action in other countries. 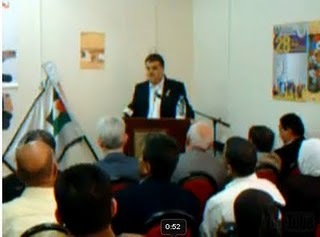 Saeed is the trade union version of Mahmoud Abbas, always willing to dance to Israel's tune. The question is how long Palestinian trade unionists are prepared to allow a quisling to head their union and allow him to get away with undermining solidarity work. I've written on Saeed's actions before but this time they have had a decisive effect in undermining the patient work of activists within Britain's second largest union UNISON. Following the decision of the 2010 UNISON Conference to suspend relations with Israel’s racist ‘trade union’ Histadrut a delegation was sent to Israel and Palestine from 27th November to 3rd December 2010. What prompted this was Histadrut’s support for the murderous attack on the Gaza Freedom Flotilla and its previous support for Operation Cast Lead, the genocidal attack on Gaza. The delegation met members of Histadrut and its two public service affiliates. It also met the Palestine General Federation of Trade Unions and other mixed unions and workers’ organisations within Israel. On the basis of talks between the delegation and Shaher Saeed, Secretary General of PGFTU, the delegation has recommended a resumption of relations with Histadrut in order to put pressure on them to take a more vocal public stance against the occupation and the settlements. Although the report does not describe UNISON’s discussion with PGFTU there is little doubt that Shaher Saeed did not support a boycott of Histadrut for the simple reason that he never has supported a boycott. When fellow union members have pressurised him he has made statements to that effect, but gone back on them as soon as convenient. This time Saeed has effectively undone the work of pro-Palestinian activists in UNISON by supporting the maintenance of relations with Histadrut. Although it is understandable that PGFTU has such relations, given the position it is in, there is no reason (apart from Histadrut threats) for it to oppose trade unions in other countries from implementing a boycott. When this arose earlier this year, PGFTU had to issue a ‘clarification’ of what Saeed had previously said. This time no amount of clarification will undo the damage that Saeed has done. As long as Palestinians are content to allow Saeed to operate as Secretary-General of PGFTU, although he has not been elected, then they will bear the consequence of having this stooge at their head. The UNISON Report is quite clear. There is no doubt that this is what they were told and there is little point in quibbling about it. The points to make is that Shaher Saeed is no different from Mahmoud Abbas and the quislings running the Palestinian Authority whose security forces are specially trained by the USA with the purpose of repressing and torturing their own people. · They fear international pressure on Histadrut would be used against them by the right wing in Israel. Of course this is disingenous. Histadrut’s ex-building company Solel Boneh (all its enterprises were sold off in the 1980s and 1990s) helped build the settlements. It takes very political positions – support for Israel’s attack on other countries for example. It is true that they are unwilling to ‘alienate’ their own members who for the most part are even more racist and backward. The Report proposes ‘critical engagement’. This seems very reminiscent of the ‘constructive engagement’ that Chester Crocker proposed and Thatcher and Reagan accepted for dealings with the Apartheid regime. It was founded on the belief that the Apartheid authorities would willingly dismantle the structures of racism. It was however not engagement, but Boycott, Sanctions and Divestment which persuaded white South Africans that their time was up. A recent development has been a conference held in Ramallah on 30th April which founded the Palestinian Trade Union Coalition for Boycott, Divestment and Sanctions. The statement they issued is here. This makes it clear that the Palestinian trade union movement syupports a full boycott of Israel. It put relations with Histadrut in that context and called on international trades unions to sever all links. It is accident that UNISON Executive have taken this opportunity not to rock the boat internationally. Motion 89 from the National Executive therefore advocates the same ‘critical engagement’ that Thatcher and Reagan pursued with South Africa (it was called ‘constructive engagement’ but the meaning is the same). It didn’t work then and it won’t work now. Racists don’t understand reasoned argument. The only thing that persuades them is pressure and force. Motion 89 can be read here. I see u decide for the Palestinians who is good to be their leaders and who is not. Well mister, British Colonialism never stops. That's the way your OLD timers, looked at the world. You are the same Racial colonist bigot. As I said Jack, Zionists and colonialists have always had their favoured quisling and you are no exception. Shaher Saeed is unelected. Abbas's term ran out over a year ago. Prime Minister Fayad has never been elected but is ex-World Bank. Collaborators and quislings are your forte since you obviously like them, just as the Mufti was t he Palestinian 'leader' chosen by the British and Zionists in 1921. Sure as u say, we are the "elder of Zion", we fix all the world. The Media the Banks, we even chose Hitler. More antisemite issues you like to add to the clear picture of what you are. I loved the issue with the MUFTI. Here is what I find only in the most antisemite blog, that I am sure you favor. Zionist-Jews elected Adolf Hitler, also known as the Founder of Israel. Al-Haj Mufti Amin al-Husseini for his resistance to the mass illegal immigration of European Jewry to British mandate Palestine. former US President Jimmy Carter. who gave Camp David to Israel Iranian President Mahmoud Ahmadinejad. Turkish Prime Minister Recep. Tayyip Erdogan. and of course the Holocaust denial organization "Institute for Historical Review" Haj Amin al Husseini, the mufti of Jerusalem, has played in Zionist and Holocaust propaganda and was elected by the Jews. racist David Duke claims the same. And of course how can I forget, Lenni Brenner. I am sure that in an intelectual debate you could convince everyone about those historical facts. I haven't said you are an elder of Zion Jack. You said it. It's not my fault if the Zionist movement, with its secret lobbies and Aipac style organisations, and its talk of 'Jewish' lobbies wants to act as some caricature of the Protocols of the Elders of Zion. I haven't been to the most anti-Semitic blog Jack. I'll leave that to you, but how would you know it's the most anti-Semitic unless you have visited all of them for your education? If the anti-Semites take their cue from you on how important the Mufti was fine. It just shows how ignorant you are since the Mufti was a minor war criminal whose SS Divisions deserted in France, where they were sent for retraining. The only example of a rebellion among SS troops ever. Not much of a war criminal and it isn't surprising. Arabs were even lower on the racial scale than Jews so your attempts to portray Arabs as supporters of the Nazis falls a bit flat. More to the point why is it that there is not one Arab among the 'Righteous of Nations'. Even Robert Satloff of a Zionist think thank in Washington, compiled a lengthy report into how Arabs had in fact saved fellow Jews. 1% of Arab Jews under Nazi/Vichy occupation perished. Compare that with 90% in Poland and we see in its starkness the use of the Holocaust as a political weapon by Zionist scum like you. You justify the very racism that led to the Holocaust and apply it to the Arabs. If you had even the trace of a conscience it would be sackcloth and ashes for life mate. You sure said we are the "elder of Zion" as you mention that "Palestinian 'leader' chosen by the Zionists"
Your low intellect don't even get, that you use only Antisemite slogans and definition. get some education, as what is the base of the "elder of Zion", that we JEWS (not Zionist ) rule the world, we JEWS CHOOSE leaders, that's exactly what you said about the Mufti. Google Mufti and Zionist, you will find your way of thinking only in antisemite blogs. You are defending the arabs, as I said anything bad about them, as your little brain cannot accept that me, a PROUD ZIONIST JEW, will say something good about the arabs. well antisemite, I don't have anything bad to say about the arabs, on the contrary, I respect and appreciate and honor them much more then you, I feel much closer to them then to a jewish antisemite like you. Clearly Jack doesn't understand irony, even given his limited command of English. When European anti-Semites use the Protocols they think of Jewish conspiracies, when Arabs do so they think in terms of Zionist conspiracies because the Protocols seem to them a reasonable explanation behind the implantation of a settler European state in their midst. In other words the social basis of European anti-Semitism doesn't exist in the Arab world. I'm sure you are capable of looking up the relevant passage in Gilbert Achcar's Arabs and the Holocaust, who incidentally was quoting Bernard Lewis. i assume you have heard of him. Your praise for Arabs is touching! But I made the point that Zionists, in particular Sir Herbert Samuel as High Commissioner, chose the Mufti above those who had defeated him in an election. And of course the Zionist leadership in Palestine much preferred dealing with the Mufti than working with Istaqlal, an explicitly secular and anti-racist Palestinian party. To all intents and purposes the Mufti displayed on the walls of that iniquitous organisation, Yad Vashem, is an apparition. That is why he is given his own wall. Not Heydrich, the 'engineer of the final solution, Himmler or Rosenberg but someone who was irrelevant to the workings of the Nazi machine. So you can visit all the anti-Semitic sites you wish Jack. No doubt they will confirm all that Zionists have to say on the subject!